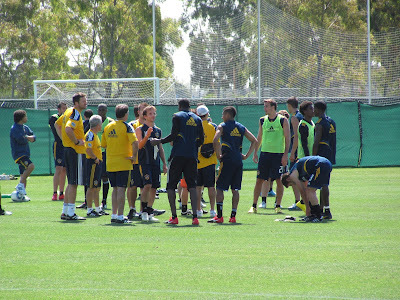 On Tuesday, the Galaxy continued their preparations for Saturday’s match against the Dynamo. It was once again a beautiful day in Southern California. The players went through the usual warm ups before breaking up into offense and defense for 15 minutes of work. 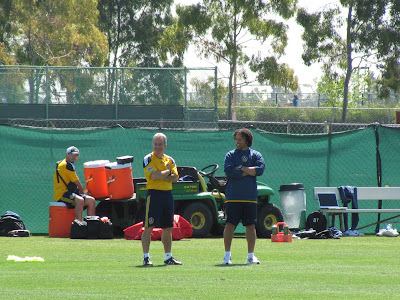 On the offensive side, assistant coaches Dave Sarachan and Cobi Jones went to one end of the field with the midfielders and forwards to work on their attacking movements, crossing and finishing exercises. Meanwhile, Bruce Arena put the defenders through their own paces working on defending different areas of the field, including two-on-two situations and defending balls in the air. 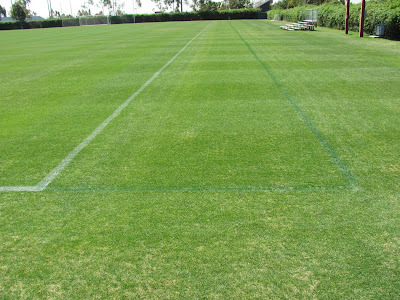 On Monday afternoon, the coaching staff had the grounds crew re-paint the lines of the training field dimensions to match that of Robertson Stadium. The Dynamo’s stadium is listed as 115x70, but the coaching staff went a little further with a width of 68 yards. With a day off tomorrow, players finished training with the strength and conditioning coach Ben Yauss, who took the players through a fitness workout, including sprints, to end the day. As some of you may have seen, the Dynamo are promoting a "Light Outs L.A. Rematch" with fans in attendance receiving a mini-flashlight, just in case the lights went out. It looks like the Dynamo have not forgotten that night. Here are a few photos from today's session, including a shot of the re-painted lines. Lol how about Houston gets some real grass first! Maybe we should all bring a handful of grass when they come and play us.